South African Pastor Mostsoeneng Mboro, a self-described prophet, once told his followers that he visited Heaven and took pictures with his cellphone. And he would show them to you… if you paid him the equivalent of $340. When pressed on it, he said the phone had been stolen. Shocking. His latest gambit? Telling his congregation that they need to foot his legal bills or church will be cancelled for months. Speaking to journalists at the Incredible Happenings Church in Katlehong on Wednesday, Mboro said he would suspend his services — including his tv show and radio station — from next week if people failed to pay his legal fees and present him with a birthday gift amounting to R4900 [$370]. It’s just like that time Jesus healed a man with leprosy, then sent him a bill and threatened never to help anyone again unless his wallet got bigger. Except for the part where someone actually got healed. 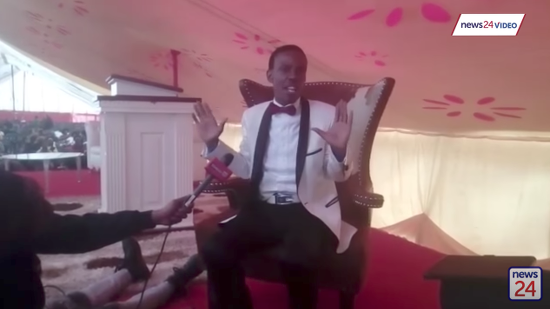 Mboro wants the money to sue the Commission for the Promotion and Protection of the Rights of Cultural, Religious and Linguistic Communities (CRL Rights Commission), which plans to crack down on fraudulent ministries. Can’t imagine why he feels so threatened by them. Christian Writer: Climate Change Is Harmless Because God "Promises Us Good"